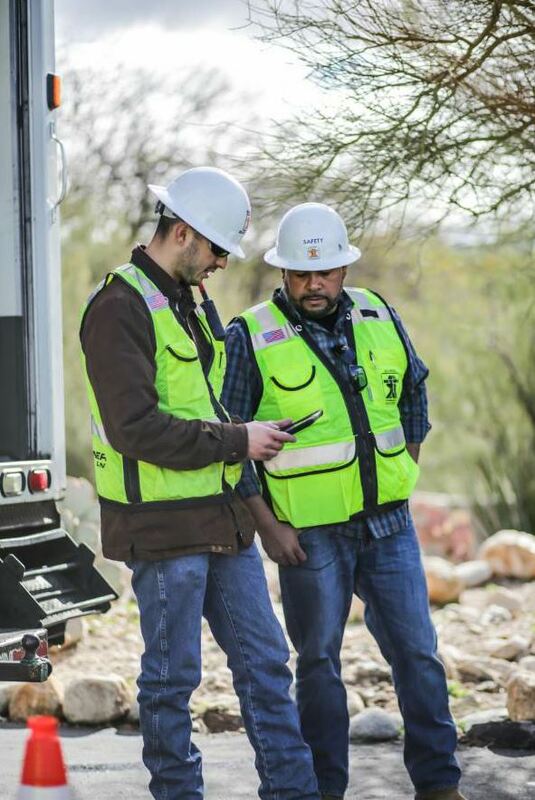 Before Rummel Construction, Inc., Scottsdale, Arizona, invested in the job costing software HCSS HeavyJob, they would often find that three different sets of quantities were being reported for each job. HeavyJob, made by HCSS, Sugar Land, Texas, has more than 45,000 users, 80 percent of whom are in the road construction industry. On an average day, the foreman will use HeavyJob to enter time cards, take and annotate photos, enter daily production data, manage subcontractor progress, record material received and installed, and fill out a daily diary about working conditions, material delays, inspections, or equipment problems. All of this information is stored in the cloud and can immediately be viewed by other users as needed. One of the key features of the software is the ability to enter time cards in the field using the iPad, have employees sign them, and send them directly to payroll. One of the key features of the software is the ability to enter time cards in the field using the iPad, have employees sign them, and send them directly to payroll. Previously, this task used paper time cards that needed to be faxed, photographed and emailed, or driven back to the main office and entered into the accounting system manually. By submitting this information digitally, foremen no longer need to shuffle through paper time cards and notes, the payroll process requires less time, and it can prevent potential errors. “The superintendents can spend more time supervising and less time filling out paperwork,” Gonzalez said, adding that it has also saved the company’s payroll staff a great deal of time. The digital time card reporting feature can even help contractors avoid claims and legal issues. 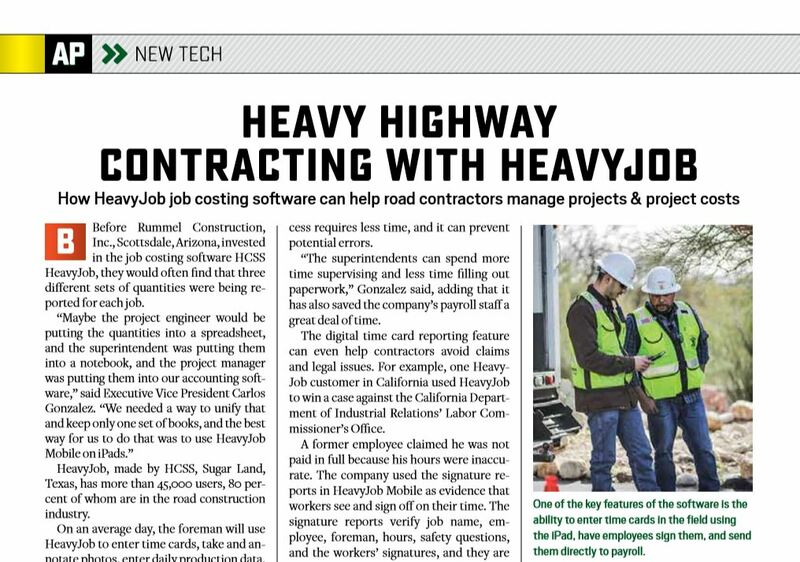 For example, one HeavyJob customer in California used HeavyJob to win a case against the California Department of Industrial Relations’ Labor Commissioner’s Office. A former employee claimed he was not paid in full because his hours were inaccurate. The company used the signature reports in HeavyJob Mobile as evidence that workers see and sign off on their time. The signature reports verify job name, employee, foreman, hours, safety questions, and the workers’ signatures, and they are signed either daily or weekly. In the past, most cost reporting was done by paper notes, emails and texts. With HeavyJob, that information is all available in one location. Gonzalez was surprised by the usefulness of HeavyJob’s diary feature. Rummel Construction has also automated the routine so quantities input to HeavyJob are pushed to the company’s accounting system automatically. HeavyJob integrates with HCSS’s other software, including HCSS Dispatcher, Equipment360, HCSS Safety, and HCSS Telematics. Rummel Construction also uses HeavyBid and HCSS Dispatcher softwares for estimating and resource management. Job estimates from HeavyBid can be exported into HeavyJob so the foreman and other field personnel can reference the productions and resources outlined in the original estimate. “The foreman can pretty much see what the estimator was thinking and know what is expected of the crew each day,” Pyle said. Reports can be generated by project or across projects and can be filtered, sorted and grouped across all available data fields. Rummel Construction has found this feature very useful. “Estimators can look at actual production rates, cost per unit, etc. and use that information for future estimates,” Gonzalez said. Rummel Construction also uses the time cards from HeavyJob to keep track of equipment and labor personnel on each project, alongside HCSS’ Dispatcher software. Foremen and crew leads can send maintenance requests and fuel transfers directly to mechanics using Equipment360. They can import time card information from HeavyJob into HCSS Telematics to verify equipment time card hours and use exception reports to spot discrepancies between reported and used hours. Since Rummel Construction first began using HeavyJob, the software’s mobile app functionality has greatly expanded. 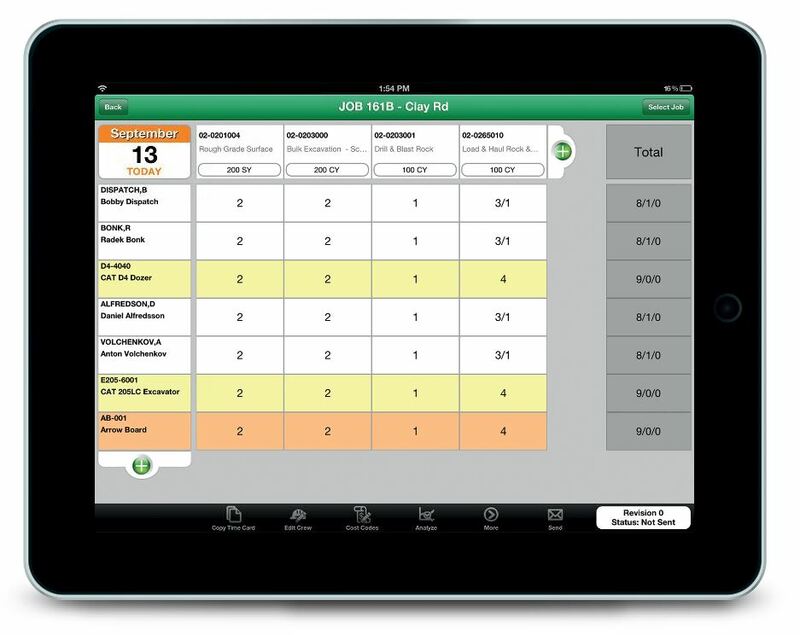 Although each foreman and superintendent with Rummel Construction has a company-issued iPad to add info to HeavyJob, the ability for employees to use the app on their smartphones makes it possible for other crew members to add information. “For example, if we set up a remote operator in one spot, we can put the app on their phone so they can do their own time card and someone else can see it from anywhere with internet access to verify those hours and quantities and approve the time card,” Gonzalez said. Gonzalez has also taken advantage of HCSS’s online forum, where users can request new features and other users can upvote ideas that would also benefit them. For example, HeavyJob previously didn’t support unit prices for some of the job analysis features, but the feature was voted in by popular demand. Pyle said HeavyJob is updated regularly with new features, often suggested by customers.